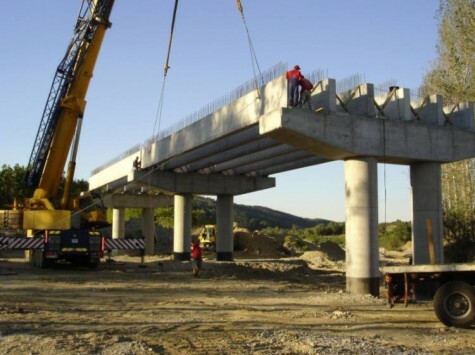 Home » Ustra Mostremont Ltd.
Ustra Mostremont Ltd. is part of Ustra Holding, JSC, with main activity – manufactures and trades of reinforced concrete elements for bridge structures. The company carries out investment projects for residential and industrial construction, infrastructure engineering and development, retaining walls and embankments, hydraulic road and bridge structures. All of the projects the company has build are in accordance with the customer requirements and existing legislation, ensuring excellent quality. The products manufactured and the construction and installation works performed by the company are in line with the requirements of the European Standard ISO EN 9001:2008 and the Quality Management System. Ustra Holding, JSC is specialized in mechanical and explosive demolition of buildings. The company has been operating in this field since March 2004 and it has modern technical equipment of leading world companies – JCB, Caterpillar, Komatsu, Hyundai, New Holland and others. The company has its own facilities and equipment for transportation, heavy construction equipment – excavators, bulldozers, wheel loaders, compressors, concrete mixers, hammer drills, hand power tools, rollers, plate compactors, hammers, tongs demolition of concrete structures, rammers, flexes for cutting concrete and asphalt and others. The diverse construction machinery and transport vehicles are maintained in repair workshops within the mechanization and motor transport facility. The company has also completed projects in the water sector and many fortifications.